Ask fellow campers about "People's Creek Campground" and nearby attractions. As others have stated, there is an upper and lower portion to this park. We stayed in the upper portion. Our site 40 is a little tight to get into and has a drainage ditch in front of it. If you are new to backing in or have a large vehicle, you might pick a different spot. However, we got in just fine. There is also a drainage ditch on spot 46, but a bit more room to turn to back in. I have posted some pics. All sites are paved and level. There is a bit of a medium sized hill pulling in and leaving, but should not be a problem for anyone, just something to be aware of. The facilities are spotless and the camp host was excellent. Our Verizon signal was very good and we had no problem setting up our Direct TV dish. We walked the lower level and all those sites were level and paved. The restrooms and showers were spotlessly clean. Again, there is a steepish hill getting in and out, but not prohibitive, just be aware. I would say if you are camping and want to be close to the swimming beach, the lower level is closer, but it is not a bad walk from the upper level. There is a marina next door and plenty of places to fish from shore. Most sites have shade trees. We enjoyed this Army Corp of Engineers Campground very much and would return again. 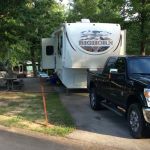 We camped at People's Creek Campground in a Fifth Wheel. We visited the Mingo Wildlife Refuge and the Stars and Stripes Museum..both interesting things to do on a hot day! We posted more pics of the Campground on google maps. Drove through the Redman ACE campgrounds and they were very nice also. the sites are very good. spacious, level concrete. the sites by the lake have nice views and the sites inside are pretty , set back under the trees. We camped at People's Creek Campground in a Travel Trailer. We stayed at the Lower Peoples Campground. The steep entrance going down into the campground will take your breath away! I do not think I have seen a steeper paved road. Check in was a breeze and not just our lot, but all of the lots were level on a paved surface, despite being in up against the side of the hill. We were right by the bath house and we saw them being cleaned daily. Lots are fairly close to each other, not smothering. The dump station on the way out was super convenient to the exit of the park. This campground does tend to flood (about 6 sites were underwater while we there), so check with the COE before confirming reservations there. We camped at People's Creek Campground in a Motorhome. The park is split into upper (FHU) and lower (E) and is in good shape. The Lake is very high from the storms this spring, but it's a very well maintained facility. A little tight with all the trees, but doable with our 38-ft DP and tow dolly. I would definitely stay here again if in this area. 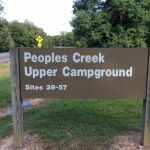 We camped at People's Creek Campground in a Motorhome. This is a great Corps of Engineers (COE) park. Long, level sites; full hook ups; 50 amp. With Golden Age pass you cannot beat $10/night. We camped four nights here. We camped at People's Creek Campground in a Motorhome. 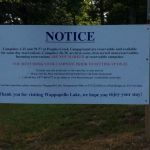 Are you affiliated with People's Creek Campground ?